In a previous article, there was of the story of the Greylag Goose with an orange collar which had been in the flock in the Shiskine Valley. The identification letters were read using a telescope and the details sent off to the British Trust for Ornithology (BTO). These marked geese are part of a long term study on the Icelandic population of Greylag Geese, trying to find out whether or not individual geese are faithful to their wintering areas from one winter to the next. The article ended by encouraging anyone who came across a ringed or marked bird to pass the information directly to the BTO or pass it to me and I would pass it on, on his or her behalf. As a result, here are two further interesting examples. A Mute Swan was seen in Whiting Bay on 27 February 2008 with an orange ring on its leg. It turned out to be part of study at Lochwinnoch. The bird had been ringed as a male adult on 12 November 2005 and had been last seen in Lochwinnoch on 8 March 2005. So much for sedentary swans: this one had travelled 44kms to Whiting Bay. 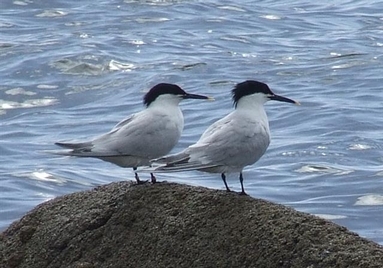 On 24 April, a Sandwich Tern was photographed with terns in Kildonan. There was a combination of rings on one leg. When the photograph was sent off to the BTO, the information that came back from the person who had been licensed to put the rings on, was that he had ringed the bird as a hatched young bird at the nest at Forvie National Nature Reserve, Aberdeenshire, in 1990. Sandwich Terns are summer visitors to the UK, wintering in Africa along the Atlantic seaboard. and so are long distance travellers. The fascinating fact was that this relatively small bird was already eighteen years old. From the BTO data on marked birds, other long lived bird species have included: Razorbill - forty one years, Curlew - thirty one years, Black-headed Gull - twenty seven years, Turnstone - twenty years, Carrion Crow - 15 years, and Barn Owl - thirteen years.